What is voice typing and why should you consider typing by voice? It’s a good question and an important one for the digital age. Technology has advanced so quickly that voice typing is now a great option for those looking to save time or who are struggling with a physical impairment. Typing by voice may seem odd at first but trust us, you get used to it fast! Voice typists help is useful if you’re on the move and don’t have time to sit down at a computer. Voice typing is a great option if you suffer from a common ailment like arthritis and it hurts to type normally. Voice typing is a wonderful option for those who multitask all day and need to keep their hands free for other reasons. 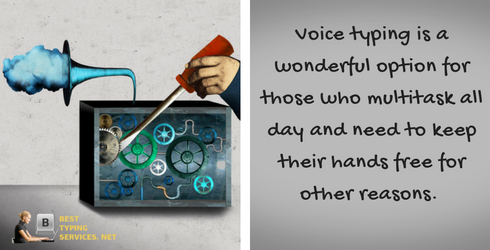 No matter your job or daily schedule, there’s always a reason why voice typing can help you! Now Best Typing Services offers our exclusive voice typing technology and training courses to make typing by voice easier than ever! Voice to typing software has been making the rounds for decades but now it’s been perfected and we’re ready to show you to get started voice typing today. No longer does typing by voice mean that you need to speak slowly or loudly in order for the software to hear you. Far from it! Voice typing technology has advanced to such a level that it can recognize hushed tones from across the room. You don’t need to use a special typing voice to make sure that what you want typed gets typed. Now you can talk as fast as you like and voice typing technology will catch your every word. With the continuous innovation of our technology, we can easily make the most of state of the art technology to accomplish our tasks efficiently. There are many tools and services available online that will help you transcribe even the most challenging projects. When it comes to choosing the best speech recognition system, make sure that you understand the extent and limitations of your needs as this will help you select the right tools accordingly. If you do not have the time to learn how to use the best voice to text app, it is more convenient to simply hire the services of experts online. Voice to text apps enables you to enjoy efficient transcription process that will, in the long run, saves you a great deal of time. In fact, many prefer using these applications and software as it is a less hassle solution than manual transcription which can be arduous. Oftentimes, using these applications can be difficult which is why it is advisable to simply avail the services of online transcription companies. One of the advantages of the popular trend of transcribing online is that you can easily hire experts that can deliver the quality that you need. Learn more about voice online typing services at our website. Transcription is a lengthy process; aside from typing the document, it is important that you perform proofreading and editing to ensure its accuracy. Majority of companies and academic institutions are looking for a convenient solution in order to easily transcribe files from documents to videos. Our voice recognition transcription is a great solution when you do not have the time to manually transcribe your files. When you avail our voice typing online services, you will be working with highly qualified transcribers that can easily ensure that your voice recognition transcription with us will be of top-notch quality. In the current digital age, you can basically make the most of convenient alternatives that will help you save time. 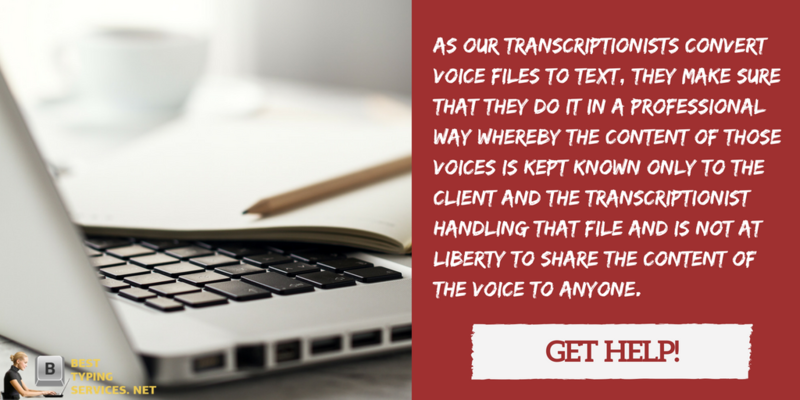 Our online voice transcription provides you the best platform in order to easily transcribe documents no matter the length or the level of difficulty. We are enhancing the process of how transcribing should be done as we utilize innovative tools and software that will help minimize the time but do not compromise the quality of your results. We can save you time to complete an error-free document at the most affordable rates thanks to our premium digital typing voice services. Typing audio to text is a very valuable and important task in various cases, and our professional local typing services have helped people of all kinds transfer countless and various different types of audio to text without a problem. One type that we sometimes get is a voicemail. This is often people that have lengthy and important voicemail messages left to them that they need in writing, but don’t have the time or energy to spare to do the transcription themselves. We know better than anyone just how challenging and energy consuming it is to complete a transcription like this, and our service is here to take this difficulty off your shoulders and provide you with the high-quality assistance that you need. Are you a professional investigator or even a freelance investigator whose work mainly depends on reading and analyzing voice conversations? If your answer is yes, you probably agree with me that the best way to analyze these voice conversations is by making sure that you get the voices transcribed to words and it becomes easier for you to read through the words of the various speakers. Since we both agree that the voices need to transcribe, it is no secret that you cannot manage to transcribe all the voices you are supposed to analyze and you will certainly need some help preferably from professional transcriptionists. It is at this juncture that the services we offer here at audio typing services are recommended; we make sure that our transcriptionists show you how to convert WAV file to text by doing it for you. Speech to text translator with us is offered mainly in two forms as manual and software-based service. We created the best software to transform well your speech into the textual format. Also, we provide specialized manual service too for these needs. Here, software-based service will often tend to offer results with little flaws in it and these flaws elimination will demand to proofread in addition. Speech into text translator software online with us is going to be a greatest and quickest help on your task. Our manual text into speech translation service is little time taking the process that is enriched with the ability to offer outstanding results in return. Our software results in the speech to text will require proofreading in addition in order to get rid of mistakes in it effectively. Our manual speech to text online service is completely perfect for your needs with an assurance for the outstanding results in return. Despite all mentioned, we are ready to help you to convert handwriting to text and many more. There’s nothing that our team of professional transcriptionists can’t convert to text, so any time that you have a piece of audio that you’re looking to get into text, just send it to us and we’ll take care of it. We don’t stop with the most accurate and efficient level of transcription, though, we also make sure that every aspect of our service is formulated to make your life easier, and to make your experience with our service better. We’ve got a customer service team that is always available and dedicated to providing you with the highest quality help of audio typing, we’ve got prices that are affordable and make our services accessible to anyone, and we’ve got a working process that keeps things simple so there are no obstacles in the way of you getting the help you need. Just head over to our site and let our pros take care of any voicemail to TXT task that you have! We also offer all our clients an opportunity to access our support team by making the services offered by the support team staff available to you on a 24/7 basis. This gives you unlimited access to the support staff where you are able to check on the progress of your quotation and whether there any problems in handling your files. This opportunity also gives you a chance to ask any questions you might have about this transcription process and our support staff will be glad to answer them so that you are able to understand why you ware the best in what we do. The support staff also makes sure that we convert voice to text, translate voice to text for you in the best way possible by following the comments and instructions you gave us during the uploading process. There’s no longer any need to slog through a lengthy transcription task, you can always just go to our service and let our pros take care of it! We’ve got the professionals, the resources, and the dedication to come up with the best results every time! Take advantage of our service today and let us make your life easier by taking a difficult task off your shoulders. Also, check our interesting post about how to translate audio file to text! 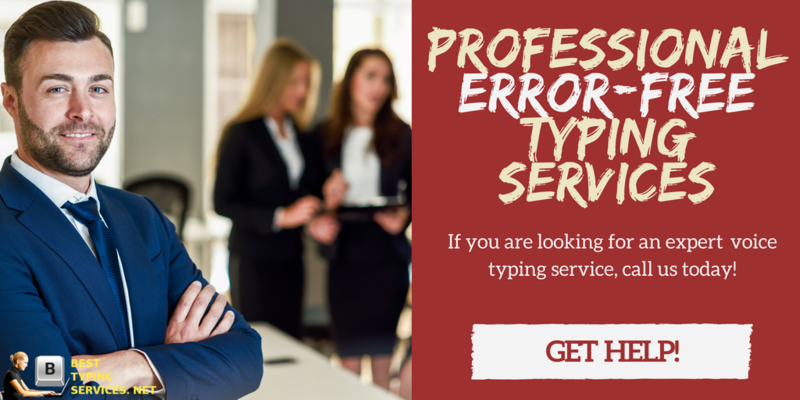 Get our professional voice typing assistance today!